Get the word out early. This is key to getting your dog/cat back safely. Don’t assume & don’t wait around to see if he’ll find his way home. As soon as you are aware that your pet is missing, GET THE WORD OUT! Find good, clear photos to have on hand just in case, and ALWAYS make sure your dogs and cats are wearing a collar with identification tags. Microchipping is an excellent form of identification, but make sure your pet has a visible collar and tags. Make posters, and lots of them. Keep it simple: “LOST DOG (or cat)!” should be at the top in large, easy to read, (even from a moving vehicle) bold letters. Then include a brief description or breed type: “Beige, wire-haired terrier ” or “Striped grey and black short-haired cat “. Don’t assume that people will know your particular pure breed, so always include a description. Include the animal’s name, it may make it easier for someone to call your pet over and capture him, and it also makes your pet into a valued member of your family, and not just another lost animal statistic. Offer a reward, don’t state how much in the ad, and include your telephone number in large numbers at the bottom of the poster. Make dozens of index cards with the same information as above, and go to every home, in every direction from the site of where your pet disappeared, and give a card, or stick a card under doors or on windshields. Stop and speak with every person you encounter –the more people know about your lost pet, the more likely the one person who spots him will call you. Your pet may be frightened, ask people to please check their barns and sheds, especially at night. Place a “Lost ” ad in your local newspaper the very first morning your pet is gone. These ads are usually free. GET THE WORD OUT! The more people know you have lost a pet, and that you are upset, worried and desperately trying to find your pet, the more people will call you if they see an animal in the woods or on the road, or in their backyard. Get out and call for your pet by name. Enlist family and friends to canvas the neighborhood, in all directions, on the roads and as the crow flies. Don’t try to predict where your pet could or wouldn’t have gone –YOU NEVER KNOW. The best time to call for your pet is at night, and at dawn. If you are calling from your car, drive slowly, roll down all the windows, stop and turn your vehicle off frequently to listen. Call all your neighbors personally. Call all veterinary clinics, including emergency veterinary hospitals outside your local area. Sometimes people pick up a stray and drive it to a distant clinic. Call all animal shelters and animal control and dog control officers, all local police and state troopers, all local kennels, the highway department, dog training clubs, grooming shops get the word out. Visit all local dog pounds and animal shelters, don’t rely on their information, go through and look at all dogs and cats, DAILY. Dogs and cats often wander far away, and do things you wouldn’t predict they would do. Try everything, look everywhere, tell everyone. You’d be surprised how many people will be supportive, will get out and help you look, will offer words of encouragement and hope, will suggest places to look that other stray animals have gone. Even the friendliest and most social pet may quickly become terrified and wild. Your own friendly pet, when lost, may hide from people, run away if he sees a person, he may even run away from you. 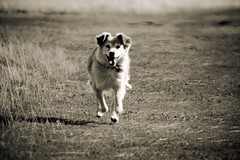 Don’t chase after a lost pet –they are much faster than we are and you’ll only scare them more. Instead, sit on the ground; talk in normal tones, repeating his name and familiar phrases over and over again. A frightened animal will usually stick around, and after a few minutes or hours,come closer and closer. In rare cases, you may need to rent or purchase a Humane Live trap, and set it to capture a terrified lost pet. Local animal shelters often rent or loan these, and will have an appropriate size for a dog or a cat. Again, DON’T GIVE UP! Be aggressive in your search, get lots of help, get the word out right away – don’t wait a few hours “to see if he’ll come home on his own “– you need those early hours to put up posters and give out cards. The methods above can be followed if you have Found a Pet as well. Here are two other Guides to aid you in finding a lost pet with a fee.